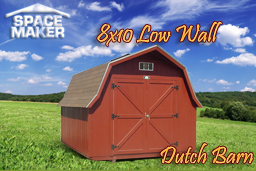 Don't settle for a standard, boring storage shed design for your farming storage needs. 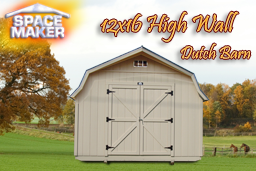 Our Dutch barns come in a range of sizes and designs, including both high and low wall designs to meet your requirements. Dutch barns are historical in the United States as one of the first barn designs, with few originals still standing and in use. However, the customization of such custom portable building designs make an excellent addition to any yard, calling attention to its unique design without being overbearing to your landscape. 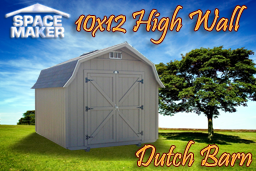 Use these Dutch barns for storage, workshops, or regaining the use of your car garage, and replace the plain boxy building that could typically be used for such purposes. Add some style to your Space Maker custom designed portable building, and pick from several customized options. 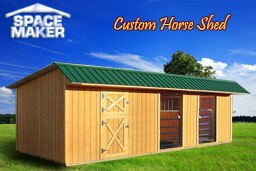 All of Space Maker Portable custom buildings can be easily adjusted and created specifically for your needs. 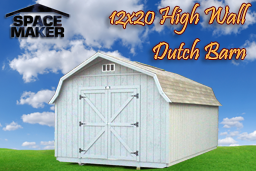 High wall Dutch barn gives you the style you want with the space you need. A portable storage shed, which can easily be moved to another location due to the ingenious design of the flooring. Resembling the intriguing and imposing design of the Dutch style barn without standing out too much. Strong timber framing and a much more aesthetic appeal than standard steel buildings. 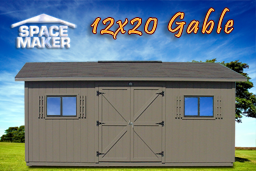 This building is perfect to house swimming pool supplies or as a storage garage.